Real Players malayalam movie directed by debutante Tivin will have Suresh Gopi in lead. To be produced by V.K.Prakash, the movie zooms into the life of a volleyball player who is forced to set up a volleyball academy due to some circumstances. Master Sanoop and Balachandran would give life to other prominent characters in the movie while the heroine is yet to be finalized. With locations set at Kasargode, Bengalaru and Ooty, the movie will start rolling by March. Tivin who has worked as an associate to popular directors like Siddique, Rafi Mecartin and Shafi is gearing up to helm an independent project. Titled 'Real Players', the movie will have Suresh Gopi in lead. To be produced by film maker V.K.Prakash, the movie zooms into the life of a volleyball player who is forced to set up a volleyball academy due to some circumstances. Master Sanoop and Balachandran would give life to other prominent characters in the movie. Rest of the cast including, the heroine is yet to be finalized. With locations set at Kasargode, Bengalaru and Ooty, the movie will start rolling by March. Suresh Gopi who is known for his Police roles would be seen in a very different avatar in 'Real Players'. The actor will play the character role of a volleyball player, a member of the Kerala team. Some political issues make him to step down from the police force and later landing in a volleyball academy. This new undertaking gets him beleaguered by problems and rest of the story moves to the next phase. Subsequent events which take plays later would keep the audience intact. Suresh Gopi who has mesmerized the audience with his charisma, unique way of acting and delivering dialogues is ready to second innings in style. After doing a cameo in 'Geethanjali', the actor would be seen in a full length character role in 'Salaam Kashmir'. 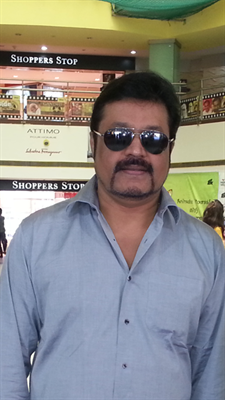 Top film makers have tightened their plans to cast Suresh Gopi in their respective ventures. Some of the committed projects are 'Dolphin Bar', 'Aanakattil Chackochi', 'Lelam -2' and many untitled ventures. Salaam Kashmir, made with a budget of 14 Crores is set to get released in the first week of December. The movie directed by Joshiy and produced by Mahaa Subair will play the role of a typical Nasrani Achayan from Travancore.